Last week here at Mount Hebron Presbyterian Church we were thinking about the perspective that Paul's experience of meeting Jesus on the Damascus Road gave to his life. Our sermon can be found here. 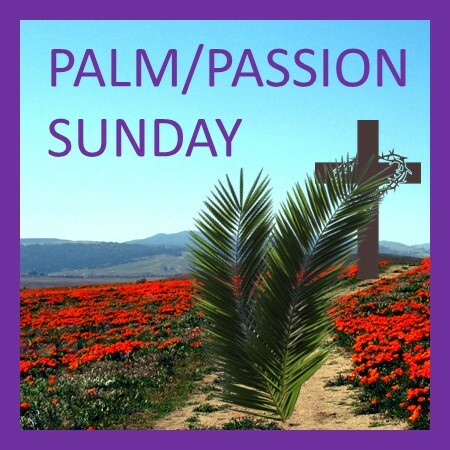 This coming Sunday we begin our journey through Holy Week with our Palm Sunday/Passion Sunday service. It is a sad reflection on human nature how quickly the cries of ‘Hosanna’ turned to cries of ‘Crucify.’ How easily public opinion can sway between welcome and condemnation. Today’s hero is tomorrow’s villain. Friar David Hirt, a spiritual director and supervisor, at St. Lawrence Seminary, in Wisconsin, offers the following reflection. and prophesy seems to arrive as we hoped. this grey temple we built with our hands. and “Crucify! Crucify,” echoes on still. Such a reflection can recall to us the importance of seeking the guidance of God in both the good times and the bad times. If we go along with the voices of the crowd, we may end up cheering somebody on the way to their death. If we add our voice to shouts of condemnation we may be found accusing the innocent. Seeking the still small voice of God amidst all the other voices that crowd in on us is never easy to do. Times in the Christian year, such as Holy Week, offer an opportunity to do some intentional “listening.” As we recall the fickle nature of the voices of the crowd we are invited to seek God’s guidance as to what is really going on! Prayer: Lord, our lives are influenced by many voices. Some cry out in fear. Some cry out in despair. Some seek to deceive us. Some come to tempt us. Amidst all the other voices, help us make time to hear Your voice. Speak to us through scripture. Speak in the silence. Speak to us we open our hearts in worship. Help us make the most of this Holy Week to discern Your will for our lives. Amen.